2472-0047 Features: -Octagon-Shaped Pole. -Hardened, Tempered Bit Holds Sharp Cutting Edge. -Hickory Handle. -30 Oz Head Weight. -Permabond Construction Between Head And Handle. -Durable, Black Epoxy Finish On Head. Product Type: -Hatchet. Handle: -Wood. Dimensions: Overall Length - Top To Bottom: -6.6". Overall Width - Side To Side: -1.4". Overall Depth - Front To Back: -13.9". Overall Product Weight: -2.2 Lbs. Durable, black epoxy finish on head. This is the tool used by colonial settlers to split shingles, shakes, and lumber for homes in early America. Today the shingle froe is still a primary tool in many traditional woodworking projects which require riving, like Windsor chair spindles and spoons. Simply pound the blade of the froe into the end of a short log with a mallet or maul. Then pull back on the handle to split off a slice of the wood with the grain. Handle is 18" long. Blade is 15" long and 2" deep. Roughly finished. Made in the USA. Make precise wood splits with the Redneck Convent Log Peeler Debarking Tool. It allows you to be much more accurate when splitting lumber, shakes, shingles, and turning blanks. You can use it for woodworking projects that require riveting such as chair spindles and spoons, split bow staves, or make tinder and kindling for a wood stove. 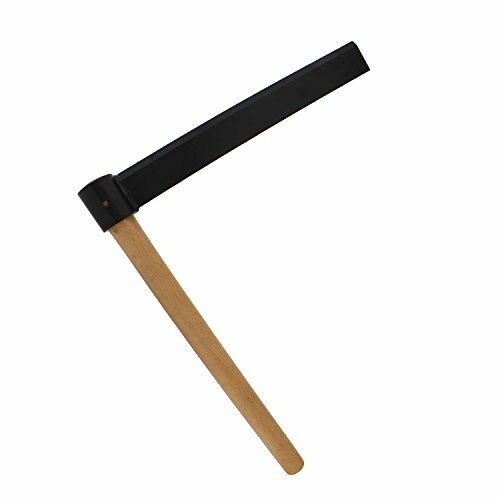 The hardened steel blade can be hammered on top with a wooden mallet to drive the blade through your piece of wood. The handle is graduated in size meaning that it tapers (one end of the handle is larger than the eye of the froe) so the blade jam fits in place and prevents the froe blade from falling off of the handle. Wooden mallet recommended, not included. WARNING: This product can expose you to chemicals which is [are] known to the State of California to cause cancer and birth defects or other reproductive harm. For more information go to www.P65Warnings.ca.gov. 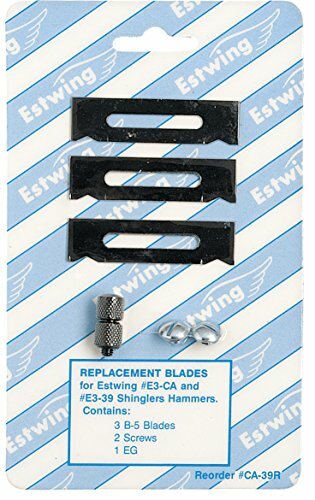 Estwing's Solid Steel Milled Face Shingler's Hammer has a fully polished head and handle neck, molded on nylon vinyl grip and a retractable cutting blade. Adjustable for 4", 5", 5-5/8" exposure. 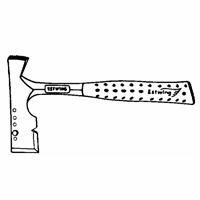 Estwing's Solid Steel Carpenters Hatchet have bonded and molded Shock Reduction Grip which offers the utmost in both comfort and durability, while reducing vibrations caused by impact. Estwing hammers are the only hammers that can make this claim. The head and handles are fully polished and are forged in one piece. Made in the USA using the finest American tool steel. 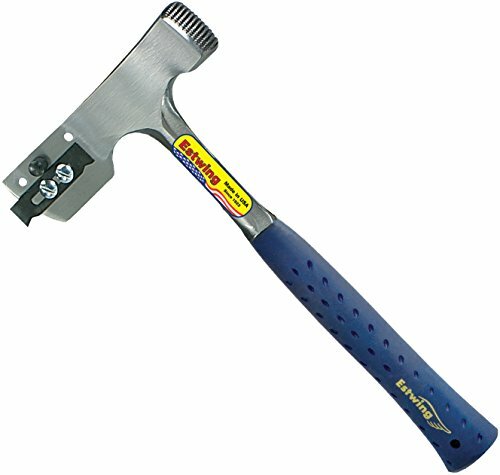 The Stanley FMHT51299 FatMax 13oz Shinglers Hammer features a patented tuning fork design which reduces harmful vibration that can cause wrist and arm injuries. Forged, one-piece steel construction allows for increased strength and durability. The ergonomically designed handle with rubber grip is designed for increased comfort and performance. 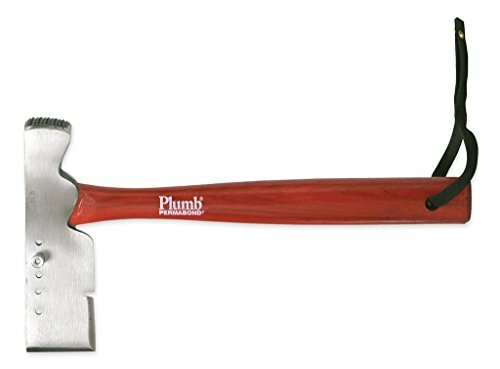 This shinglers hammer has a checkered face and straight handle. Limited Lifetime Warranty. 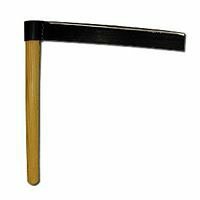 Stationary Gauge "Speed" Roofing Hatchet - best selling hatchet. Stationary screw gauge can be set for 4", 5", or 5 5/8" shingle exposure. Useable with left or right hand. Head weight is 18 oz. 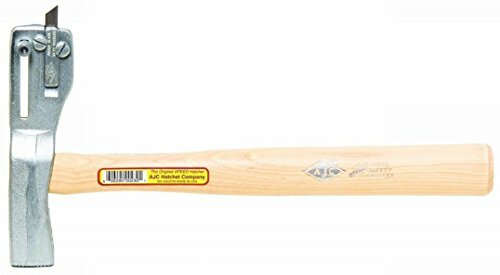 ABC Hammers, Inc. is the leading manufacturer of the highest quality, non-marring, non-sparking, non-magnetic and non-corrosive striking tools. 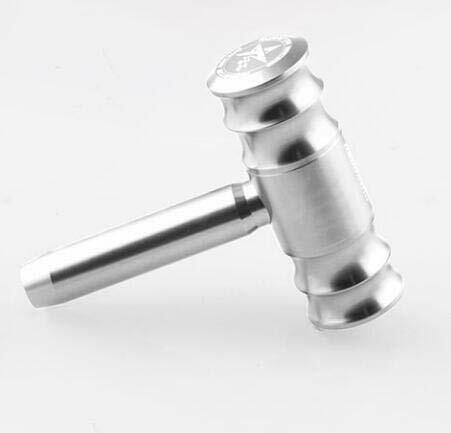 The Original ABC Brass Hammers were developed by the parent companies, ABC Foundry and American Precision Castings. These hammers were carefully designed to provide superb balance, comfort and control for use in the foundry, machining and tooling operations. Non-sparking: For safe use near combustible materials. Non-marring: Helps absorb impact and helps reduce work damage where surface protection is critical. 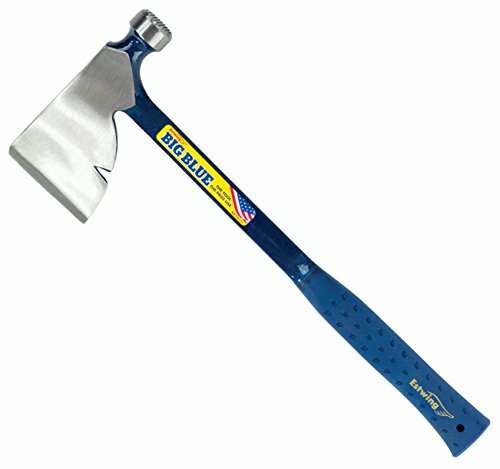 This Estwing solid steel shingler's hatchet is light weight. It has a replaceable gauge and a bonded and molded Shock Reduction Grip. The grip reduces shock up to 70% and will not come off. 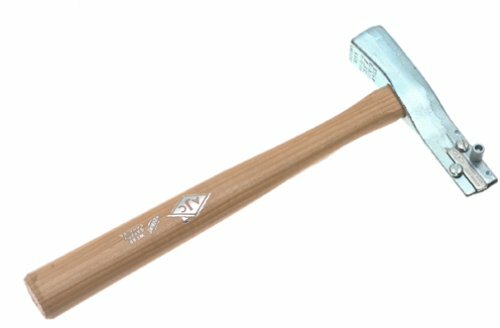 Estwing hammers are the only hammers that can make this claim; the head and handle are forged in 1-piece and are fully polished. This tool has unsurpassed balance and temper. Made in USA. Always wear safety goggles. Bystanders shall also wear safety goggles. 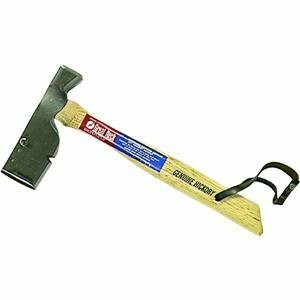 Metric Adjustable Gauge "Speed" Roofing Hatchet - AJC's Roofing Hatchet is made from heat treated, drop forged carbon steel, the finest carbon steel blade, and the highest grade hickory handle for shock absorption. This model includes an adjustable sliding gauge to compensate for wear and to match other hatchets exactly. 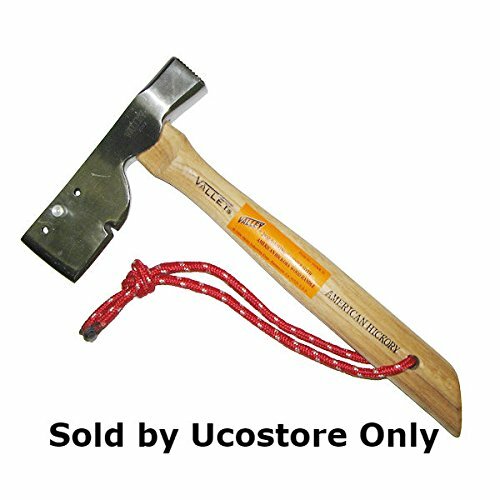 This hatchet measures metric and is adjustable on both sides from under 4 inches to over 5-5/8 inches. Head Weight: 19oz. Warranty: All AJC products come with a lifetime guarantee against defects in material and workmanship. Any product meeting this criteria will be replaced immediately, free of charge. However, this warranty does not cover products that are worn out, misused or abused. AJC reserves the right to make the final judgement on all warranty claims. The GreatNeck 20 oz. 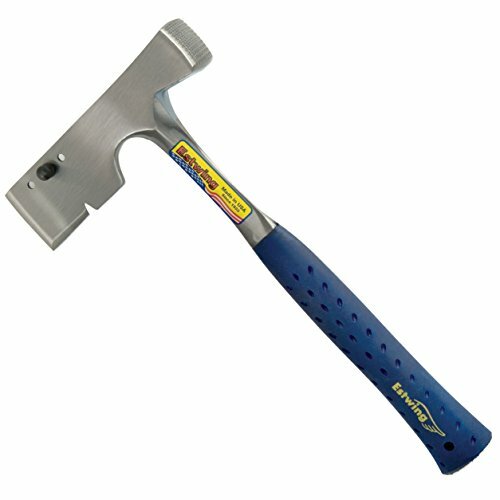 Roofing Hatchet is ideal for installing and trimming metric and standard shingles. It features a drop forged steel head for strength and durability and is fully polished to resist rust. A genuine hickory handle provides comfort and control and includes with a leather carrying strap for easy transportation. 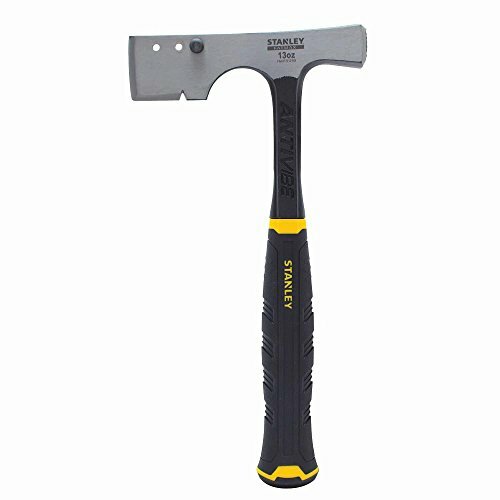 The solid steel shingler's hatchet has a fully polished head and handle neck, molded on nylon vinyl shock reduction grip. """THIS IS WHAT YOU NEED The Handle Hammer was made of the leading quality with vastly benefits that others products don't have. 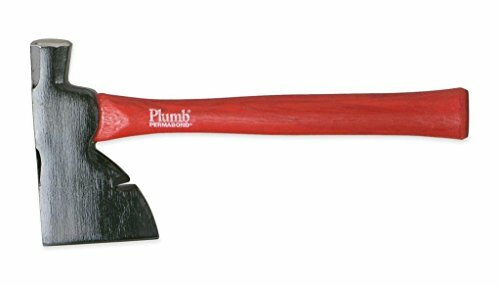 Therefore we believe that this items will definitely satisfy your need"""
DURABILITY: This claw hammer comes with sturdy handle will provide you a good hammering experience. It is made of solid and durable stainless steel so you can use it for long time. MULTI-PURPOSE: Claw hammer is built to handle tough jobs. The drop forged steel head is heat treated for strength and durability so you have the confidence to make this your hammer for daily jobs. Curved claw for extraction and demolition. REPUTATION: For us, customer's satisfaction is our top priority. We always try our best to satisfy the needs of customers, so we are willing to take all your feedbacks and comments. Experience our products and send us feedback now! NOTE: Our normal delivery time is within 15-20 days. If you ordered our item, we can not cancel your order which is being shipped on the way. What are you waiting for? Press the ""ORDER"" button now! Note: Products will be shipped within 25-30 days. Read the instructions carefully before using. Thank you! 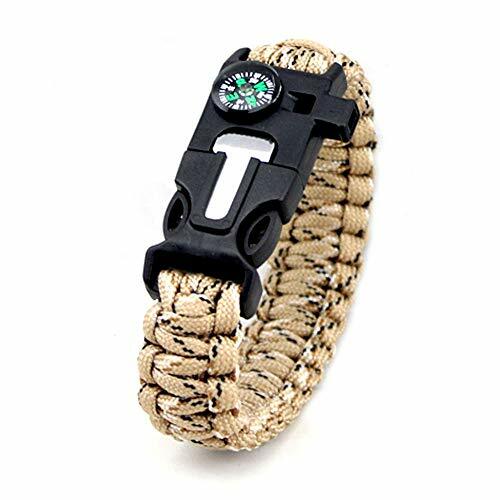 You are looking for useful tool to protect you while climbing mountain. Please visit our store at HeroStore, we assure to bring you many wonderful hiking climbing gear with the best solution and destination, definitely to satisfy you! PERFECT FUNCTION: It supports your climbing safely and effectively and protect you safely. So you don't need to worry when going hiking with your friends. PORTABLE AND HANDY: Lightweight and compact, takes almost no space in your backpack and easy to carry on. BEST PRICE: Some other products in the market might have cheaper prices but low-quality, broken soon. Come with us, we always assure that we bring you the most reasonable prices with the best quality. CUSTOMER IS GOD: For us, customer's satisfaction is our top priority. We always try our best to satisfy the needs of customers, so we are willing to take all your feedbanks and comments. Experience our products and send us feedback now! NOTE: Our normal delivery time is within 15-20 days. If you ordered our item, we can not cancel your order which is being shipped on the way. 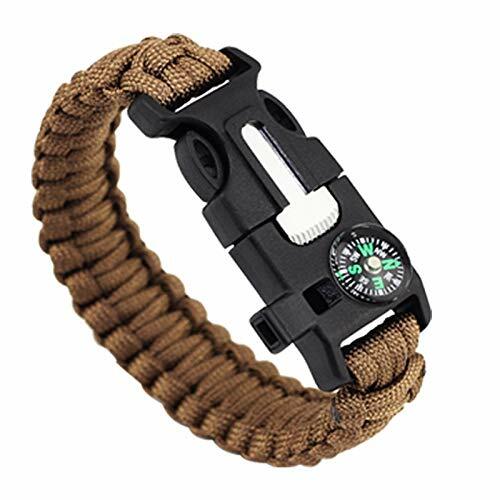 You are looking for useful tool to protect you while climbing mountain. Please visit our store at HeroStore, we assure to bring you many wonderful Carabiner Hook Gear with the best solution and destination, definitely to satisfy you!